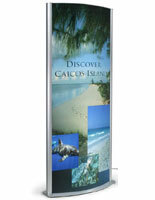 Need an eye-catching sign for lobbies and hallways? 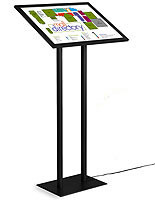 This light box display stand is great for showcasing large posters, advertisements and wayfinding information. 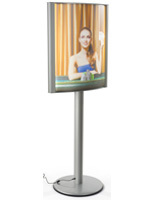 A backlit fixture is a perfect way to attract customer attention in malls, movie theaters, retail stores and other venues with heavy foot traffic. 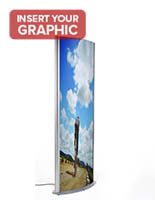 These illuminated frames feature snap-open enclosures for changing graphics with ease. 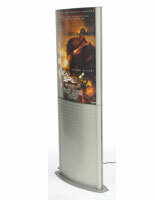 A clear lens protects the large posters from damage in busy interiors. 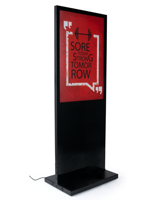 This type of panel is freestanding, and only requires a power source to effectively advertise its message. 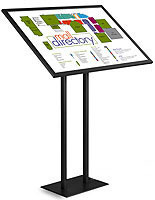 Each light box display stand envelops inserts in bright light to capture the attention of passersby, making it ideal for maps, sales info and company logos. 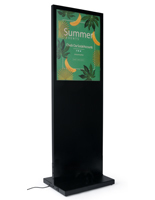 This illuminated display stand is available in (2) main configurations: the tall totem fixture and the angled frame. Each type of sign has a different construction and use. 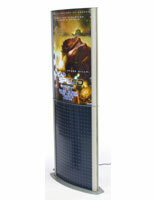 Totem panels are double sided and can hold (2) separate large posters at once. These measure 67” or taller and use fluorescent bulbs that cast a brighter light than LEDs. 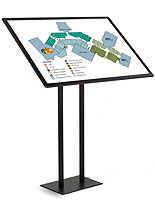 Angled graphic stands are shorter and are often used for showing maps in malls and stadiums. These use energy efficient LEDs which last approximately 100,000 hours and save money on power bills. While fluorescent bulbs have a shorter lifetime, they can be changed with ease. 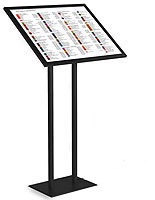 Whether it’s showcasing an advertisement or a directory, the freestanding image holder will capture the attention of passersby.